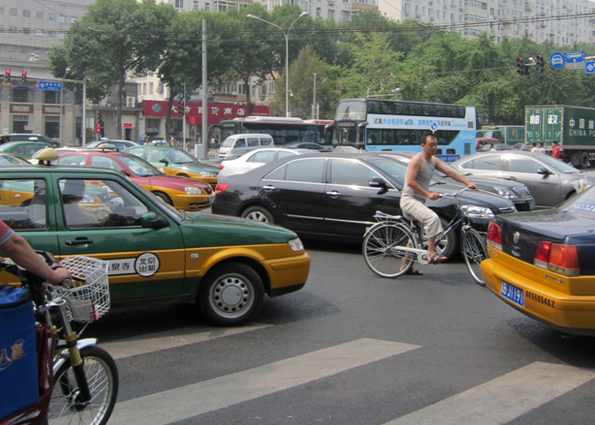 Vehicular traffic is taking over the Chinese cities (here Beijing). Still there are a high number of cyclists on the streets. But the bicycle culture is suffering under the new king of the road and so are the cities. With Copenhagen facing the issue of whether the solution to reduce car traffic in the central city is the “Betalingsring” (Payment Ring), hand in hand with reduced fares on public transportation or not, many other cities around the world also struggle with vehicular traffic taking over the streets. Traveling and working in China this issue is even more present. 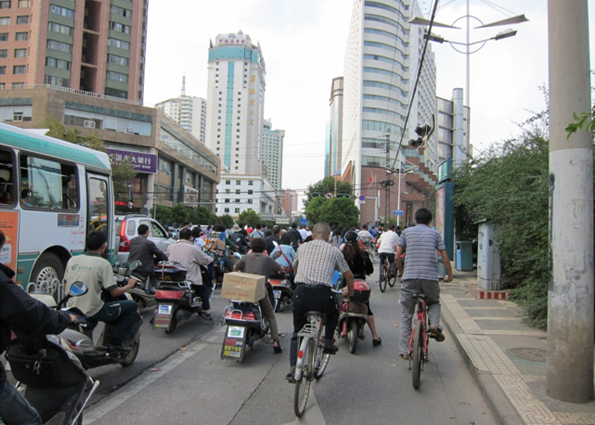 In China the urban population is growing rapidly and so is the number of cars. In Beijing 1000 new vehicles enter the streets every week. This is a trend we see all over China; the car is the king and it is a popular king. This is true even though there is a long tradition of bicycling and we still see a high number of cyclists on the streets: both commuters on regular bicycles and on the very popular E-Bike, sometimes carrying four to five people at a time, as well as traders taking their goods to the market on bicycles loaded with everything from pineapples to birdcages. But the bicycle culture is suffering under the new king of the Chinese roads. And so are the cities. 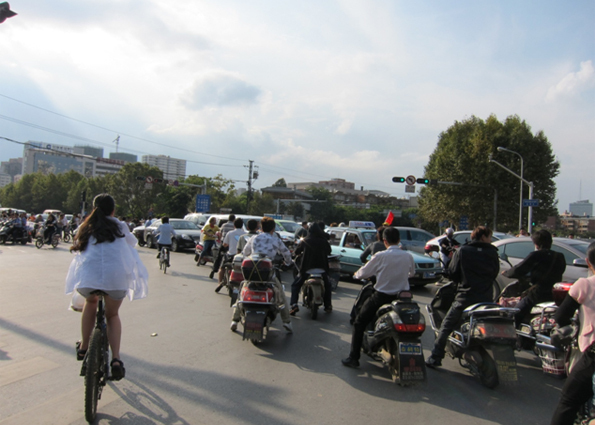 Traffic is chaotic and hours spent on congested roads, or as for these cyclists in Kunming waiting to cross the road, cause even more chaos as people try to weave their way through traffic. Congestion is a major challenge and it affects the nation on many different levels. Besides hours wasted on congested roads, pollution is a major challenge to both the environment as well as to public health. In Kunming, a city of 5 million inhabitants in the south of China, they want to turn this situation around in order to solve the rising congestion problems that the city faces. They are planning for better public transportation and have succeeded in introducing a BRT system and several metro lines are under construction. Still, there is a need to take more means into consideration in order to ensure a better traffic flow on the streets of Kunming. Going from the central city to the airport – a distance of 7km, really showed us how congested the city is, especially at peak hours: 1 hour and 24 minutes later we arrived to the airport. For my colleagues and me this was just one day and one trip, but for the citizens of Kunming this is everyday life. Traffic is chaotic. Cars, buses, bicycles, e-bikes and pedestrians all try to make it the best they can, causing even more chaos. Cars occupy the BRT lane and the bicycle lanes often lack direct links, causing cyclists to go in the wrong direction and crossing at red lights and even more often parked cars block the bicycle lanes. And by looking at the faces of the people waiting for the next BRT bus it seems that they have been waiting for quite a while and this probably does not add a positive image to public transportation. During rush hour in Kunming even very short distances become extremely long as the traffic snails its way through the city. A trip of 7km, from the central city to the airport by car, can take more than an hour. 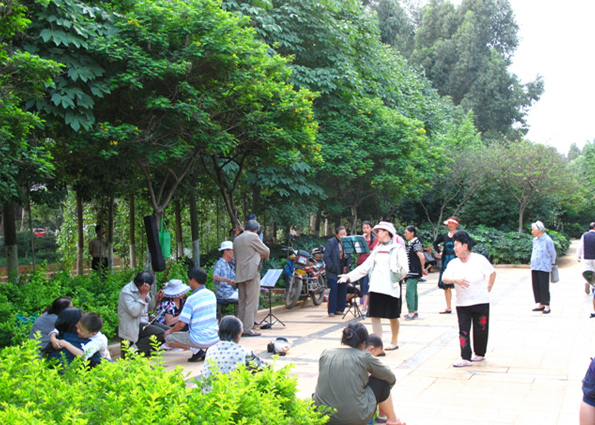 I do want to stress the fact that Kunming in many aspects is a really wonderful city. 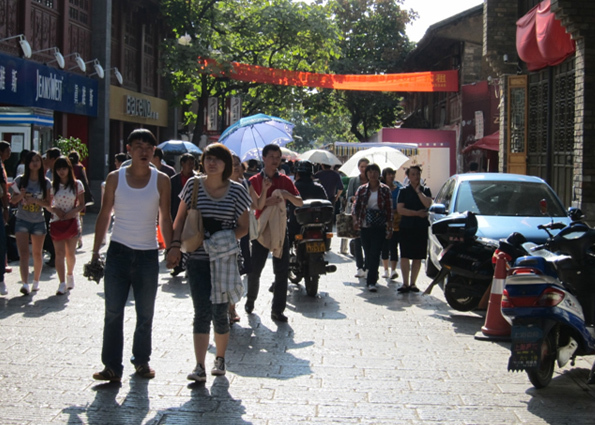 Besides being known as ‘Spring City’ because of the warm climate, Kunming has a pedestrianized city centre with beautifully renewed historical buildings, markets and with modern shopping streets blending in. It is surrounded by amazing nature areas, from mountains to lakes and rivers and the Panlong River runs like a structural backbone through Kunming providing a distinct character to the city, even though this could be explored even more. But the fact that the city is expanding rapidly with numerous new town areas, many along the Panlong River, lacking centers of their own puts high pressure the old city centre and even more so on the roads. Kunming is not only traffic chaos. The old city centre is very pedestrian friendly and offers both historical environments and markets as well as modern shopping streets and restaurants. How can Kunming keep expanding to meet the demands for new housing areas, adding more users to the roads and at the same time solve the rising congestion problems that the city faces? Is it enough to improve public transportation and walking conditions in the city or is it essential to re-brand the bicycle as the most sustainable and fastest way to get around and in that sense support it by improving the conditions for cyclists in the city? Is it a question of looking into traffic modal split on the existing roads or even road pricing? Or is it a question about traffic culture and focusing on how to change that culture and is that even possible? And so on. And this does not only apply for Kunming, but for numerous cities all over China. There is no doubt about it being highly complex and it might not be a question of driving or not driving. The fact that the car is popular cannot and should not be ignored, but something needs to be done in order to create balance on the streets and to obtain good urban environments for all. 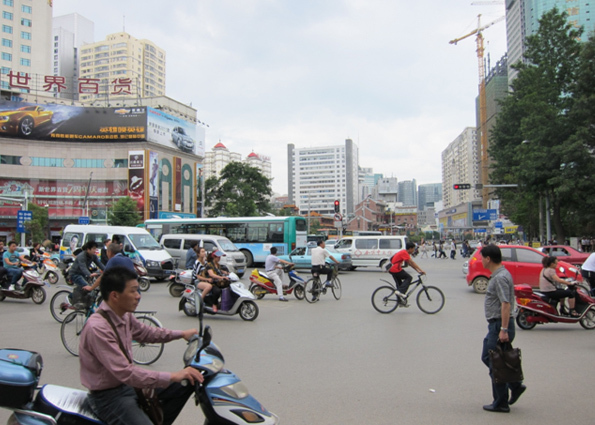 Kunming is a rapidly expanding city and the congestion problems are rising as more cars enter the streets. To ensure a good urban environment for all users, the question is whether to keep expanding the roads and invite even more cars in, or whether focus should be on improving the conditions for public transportation, pedestrians and cyclists.